At McDarmont Web Design we develop your website to look and function based on your wants and needs. We will work with you to come up with the best possible plan that will meet your business or organizational goals. We will help you make your ideal website come to life. If you want your website to look and function a certain way then we WILL make sure you have it that way. A content management system can be set up on your website that will allow you to manage and update your website on your own without any web knowledge needed. You would be given a backend log-in page (i.e. www.yourdomainname.com/administrator) with a user name and password to log-in to the content management system. From there you will be able to make changes and updates to your website on software that is as simple as using Microsoft Word. When your website has a content management system included McDarmont Web Design will offer tutorial sessions to as many users as needed to teach them how to use the system. Search Engine Optimization. At McDarmont Web Design we are skilled in all the methods and techniques to provide your website with the best search engine positioning possible. Check out our search engine optimization package HERE. 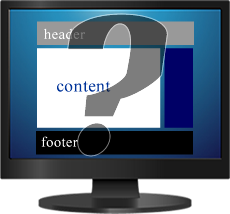 Once your website is up and running there may need to be additions or changes to the site. All clients of McDarmont Web Design receive one FREE hour of maintenance each month. All maintenance thereafter will be billed at an hourly rate. Clients who anticipate a large amount of maintenance may purchase a fixed fee maintenance package that will cover all maintenance on the website for one year. Do you already have a website but are unsatisfied with the content or overall design? If this is the case then we can work with you to take your website to a new level so you can be comfortable and confident with your website. We will build your campaign around well-produced video messages, followed by comprehensive maximization of exposure through Social Media campaigns. In most cases, that will include some design, public relations, social community management, short-term and long-term campaigns and promotions, social aggregation, analytics and reporting. If you have your website developed by McDarmont Web Design we offer an extremely affordable hosting package that includes seven day backups, high volumes of storage space and bandwidth. We have the experience and capability to provide you with any graphic design need you might have such as custom logos, newsletters, brochures, and much more. Do you need a custom web application for your site to help in providing a specific task such as a Rent Calculator to determine a tenant's rent at an Elderly Housing apartment complex? If so, let us help you develop this application that will meet your needs, help your customers, and save you time!